On March 6, 2018, the U.S. Court of Appeals for the District of Columbia Circuit (D.C. Circuit or Court) issued an unsigned per curiam opinion, revising its July 2017 decision which struck down portions of the U.S. Environmental Protection Agency’s (EPA) 2015 Definition of Solid Waste (DSW) Rule. This revision followed the court’s invitation in its July 2017 decision to have parties provide additional briefing on whether one of the vacated components of the decision should be severed and affirmed. Both industry and the EPA took advantage of the invitation and filed petitions for rehearing addressing the Court’s directives in addition to other concerns. Environmental groups argued that the Court should not vacate the mandatory Factor 4 requirement when determining the legitimacy of whether waste is recycled nor should it vacate the Verified Recycler Exclusion (VRE) provision because of concerns that eliminating these provisions would disrupt the progress of important health and environmental protections. The EPA sought clarification of the effect of vacating Factor 4, while industry groups sought to undo the disqualifier for spent catalysts (to which EPA had no objection) and advocated that Factor 4 should be vacated in its entirety because it amounted to regulatory overreach on the part of EPA. In 2008, EPA updated the DSW Rule (2008 Rule) and identified four factors to determine the legitimacy of recycled hazardous secondary material (HSM) when considering whether such material should be excluded from the definition of hazardous waste because such matter is being recycled or reused. The first two factors were mandatory, while Factors 3 and 4 had to be “considered,” but not necessarily met. In 2015, EPA revised the 2008 Rule and made all four of EPA’s legitimacy factors mandatory. These factors required that in order for recycling to be considered legitimate: (1) the recycling of HSM must provide a useful contribution to the recycling process or to a product; (2) the recycling process must produce a valuable product or intermediate; (3) the HSM must be managed as a valuable commodity; and (4) the product containing HSM must be comparable to a legitimate product, i.e., there are no “toxics along for the ride” in the product. Although more stringent than the 2008 Rule, the 2015 Rule Revision provided some flexibility for waste generators seeking to meet the factors, including a self-certification option for facilities that could not meet Factor 4. The 2015 Rule Revision also redefined and made more stringent the “containment” standard, which must be met in order for generators seeking to recycle waste to qualify for the Generator-Controlled Exclusion. Additionally, the 2015 Rule Revision withdrew the 2008 Rule’s Transfer-Based Exclusion and replaced it with the VRE. 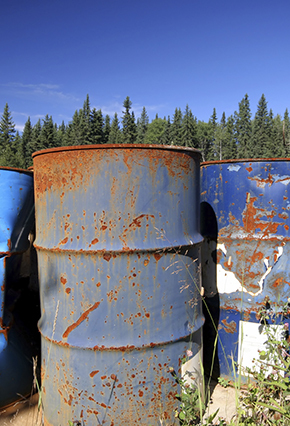 The VRE required that all hazardous materials recyclers obtain Resource Conservation and Recovery Act (RCRA) permits or obtain a variance prior to operating under the exclusion. The VRE also required that generators and recyclers meet emergency response and preparedness requirements and imposed a public participation requirement for recyclers seeking an exclusion pursuant to this provision. The 2015 Rule also specifically revised the containment standard aimed at preventing the pyrophoric risk of spent petroleum catalysts. More information about the 2015 Rule can be found in an earlier alert. The 2015 Rule was challenged in the D.C. Circuit by both industry and environmental groups, with industry groups advocating for a reversion to the more relaxed 2008 Rule, specifically challenging the VRE and Factor 4. The Court’s July 2017 decision sided with industry on both of these issues. In its decision, the three judge panel vacated most of the verified recycler exclusion and reinstated a more relaxed transfer-based exclusion for generators seeking to use legitimate third-party recyclers of HSM. The Court’s ruling also vacated Factor 4 with respect to the sham recycling provisions of 40 C.F.R. §261.2(g) but did not vacate Factor 4 where it had been written into specific exclusions such as the generator control exclusion. The July 2017 ruling also invited parties to consider briefing whether any of the vacated components should instead be severed and affirmed. Both industry and environmental groups submitted briefs petitioning for rehearing, which led the court to review its July 2017 decision. In this most recent D.C. Circuit opinion, the Court modified its July 2017 opinion in three important ways: (1) severing and affirming EPA’s removal of the spent petroleum catalyst bar from the vacated portions of the VRE; (2) vacating the 2015 Rule’s mandatory Factor 4 in its entirety; and (3) reinstating the 2008 Rule version of Factor 4. In reaching this determination, the court again sided with industry and adopted the assertion that Factor 4 was challenged in its entirety, rather than only in part. The court also ruled that the revised definition of ‘contained’, in C.F.R. § 260.10 shall apply to both generators and third-party recyclers and remains unvacated. Additionally, the court found that EPA's revised containment standard, which the court upheld despite eliminating other aspects of the VRE, is sufficient to allow spent catalysts to qualify for the transfer-based exclusion, eliminating the need for a separate exclusion. Although the substantive requirements of Factor 4 as promulgated in the 2015 Rule Revision have been vacated and replaced with the 2008 Rule Factor 4 requirements, Factors 1 through 3 of the 2015 Rule Revision remain effective. Additionally, the revived transfer-based exclusion requires third-party recyclers to “contain hazardous secondary materials” and both generators and third-party recyclers will be bound by the revised (and unvacated) containment standard found in the definitions at C.F.R. § 260.10. There are also some broader implications to this ruling. For example, the Court’s decision makes it more likely that HSM will be kept out of the hazardous waste regime. Additionally, the ruling will provide manufacturers a less expensive alternative to using new or raw materials and provide cost savings for the recycler and the generator while allowing for the preservation of valuable resources. Van Ness Feldman closely monitors and counsels clients on waste, water, air, and other environmental regulatory developments. If you would like more information about the DSW Rule or have specific compliance questions, please contact Gwendolyn Keyes Fleming, Marlys Palumbo, Britt Fleming, or any member of the firm’s Environmental Practice in Washington, D.C. at (202) 298-1800 or in Seattle, WA at (206) 623-9372.